How can an Ecological Footprint Contribute to Green Economy in Africa? Download "How can an Ecological Footprint Contribute to Green Economy in Africa?" 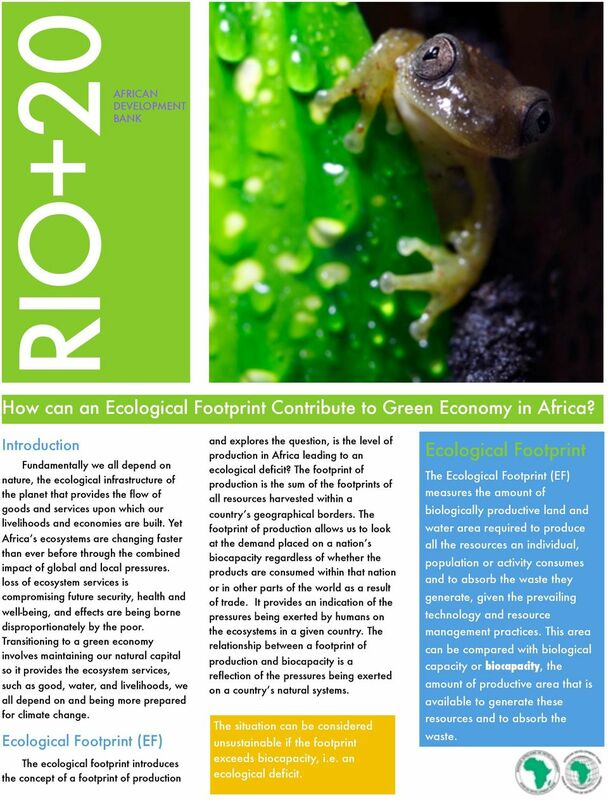 1 RIO+20 AFRICAN DEVELOPMENT BANK How can an Ecological Footprint Contribute to Green Economy in Africa? Introduction Fundamentally we all depend on nature, the ecological infrastructure of the planet that provides the flow of goods and services upon which our livelihoods and economies are built. Yet Africa s ecosystems are changing faster than ever before through the combined impact of global and local pressures. loss of ecosystem services is compromising future security, health and well-being, and effects are being borne disproportionately by the poor. Transitioning to a green economy involves maintaining our natural capital so it provides the ecosystem services, such as good, water, and livelihoods, we all depend on and being more prepared for climate change. Ecological Footprint (EF) The ecological footprint introduces the concept of a footprint of production and explores the question, is the level of production in Africa leading to an ecological deficit? The footprint of production is the sum of the footprints of all resources harvested within a country s geographical borders. The footprint of production allows us to look at the demand placed on a nation s biocapacity regardless of whether the products are consumed within that nation or in other parts of the world as a result of trade. It provides an indication of the pressures being exerted by humans on the ecosystems in a given country. The relationship between a footprint of production and biocapacity is a reflection of the pressures being exerted on a country s natural systems. The situation can be considered unsustainable if the footprint exceeds biocapacity, i.e. an ecological deficit. Ecological Footprint The Ecological Footprint (EF) measures the amount of biologically productive land and water area required to produce all the resources an individual, population or activity consumes and to absorb the waste they generate, given the prevailing technology and resource management practices. This area can be compared with biological capacity or biocapacity, the amount of productive area that is available to generate these resources and to absorb the waste. 3 Africa s Ecological Footprint Africa comprises 2,960 million hectares of land, 1,815 million of which are counted as bioproductive area in the 2008 National Footprint Accounts. Of this bioproductive land area, 627 million hectares are forested, 246 million are cropland, and 911 million are grasslands. Infrastructure occupies 31 million hectares. Africa also has 115 million hectares of continental shelf area and 67 million hectares of inland water. Taking into account differences between average African yields and corresponding global yields for cropland, grazing land, forest, and fisheries, Africa s total biocapacity is 1,423 million gha. The Living Planet Index reflects the state of the planet s ecosystems. 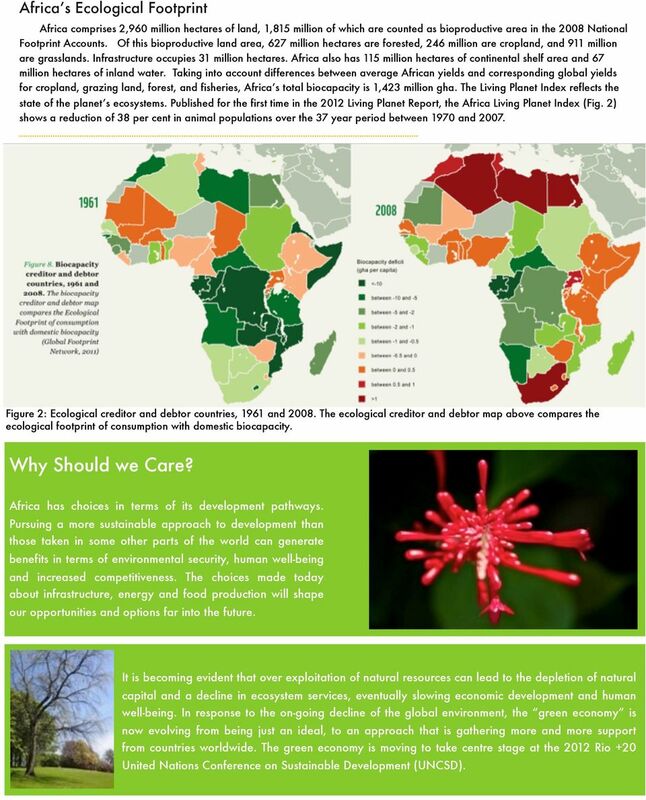 Published for the first time in the 2012 Living Planet Report, the Africa Living Planet Index (Fig. 2) shows a reduction of 38 per cent in animal populations over the 37 year period between 1970 and Figure 2: Ecological creditor and debtor countries, 1961 and The ecological creditor and debtor map above compares the ecological footprint of consumption with domestic biocapacity. Why Should we Care? Africa has choices in terms of its development pathways. Pursuing a more sustainable approach to development than those taken in some other parts of the world can generate benefits in terms of environmental security, human well-being and increased competitiveness. The choices made today about infrastructure, energy and food production will shape our opportunities and options far into the future. It is becoming evident that over exploitation of natural resources can lead to the depletion of natural capital and a decline in ecosystem services, eventually slowing economic development and human well-being. In response to the on-going decline of the global environment, the green economy is now evolving from being just an ideal, to an approach that is gathering more and more support from countries worldwide. The green economy is moving to take centre stage at the 2012 Rio +20 United Nations Conference on Sustainable Development (UNCSD). 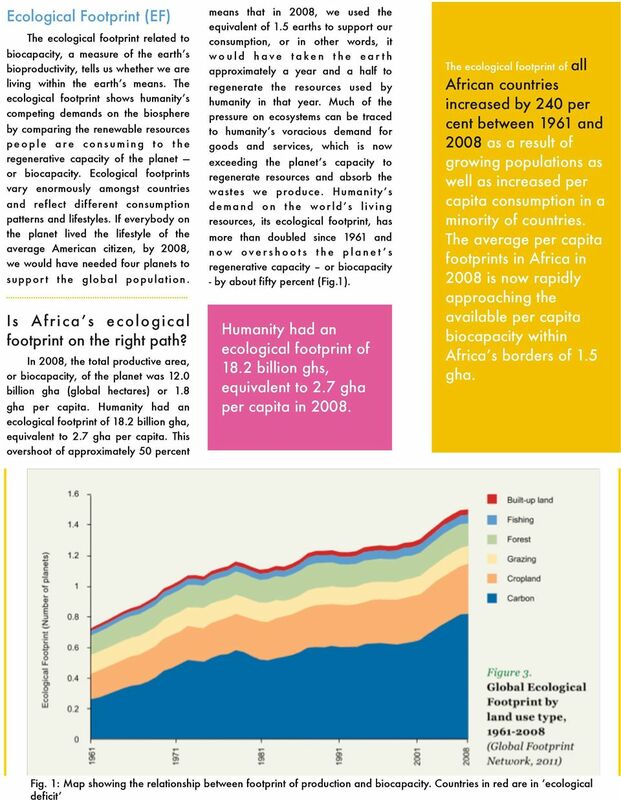 4 The 2012 Africa Ecological Footprint Published and launched for the first time on the continent, this edition of Africa Ecological Footprint Report focuses on green infrastructure for Africa s ecological security. 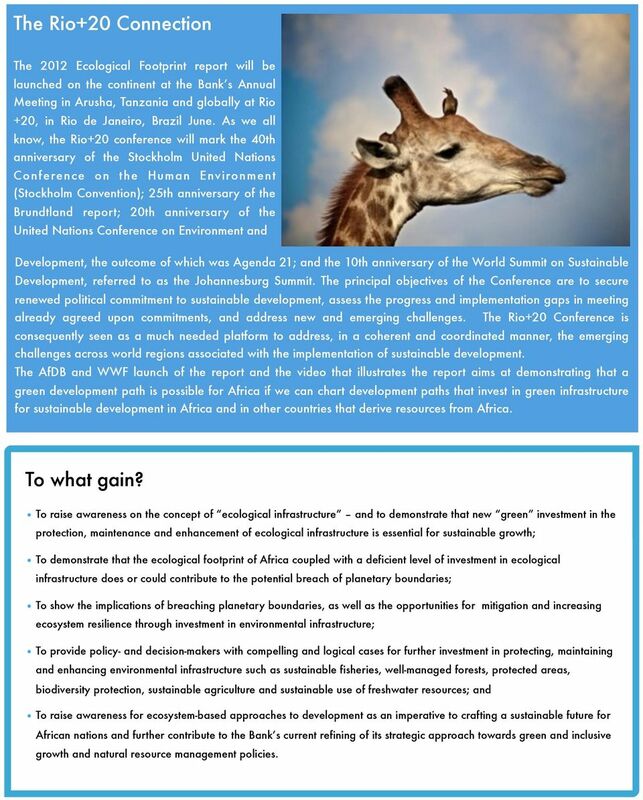 The report is a joint publication between the African Development Bank (AfDB) and the Worldwide Fund for Nature (WWF). Specifically, it sets out some of the challenges associated with lifting Africa s growing population out of poverty and ensuring their well-being can be sustained in a resource constrained world. It analyses the current demand for land and water resources in Africa. It argues that Africa is still endowed with a lot of bio-capacity, although witnessing a decline in biodiversity and under major stresses because of significant drivers such as trade, climate change, and unsustainable development decisions. 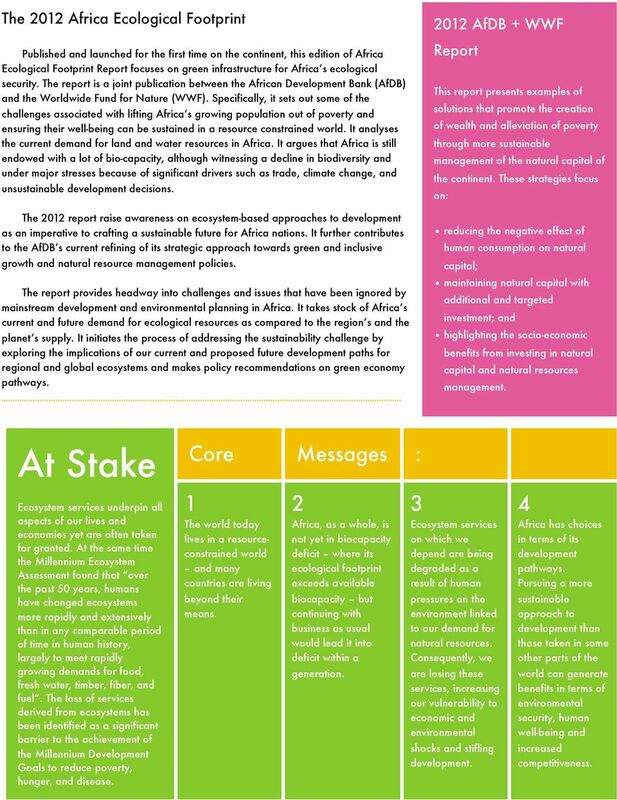 The 2012 report raise awareness on ecosystem-based approaches to development as an imperative to crafting a sustainable future for Africa nations. It further contributes to the AfDB s current refining of its strategic approach towards green and inclusive growth and natural resource management policies. The report provides headway into challenges and issues that have been ignored by mainstream development and environmental planning in Africa. It takes stock of Africa s current and future demand for ecological resources as compared to the region s and the planet s supply. It initiates the process of addressing the sustainability challenge by exploring the implications of our current and proposed future development paths for regional and global ecosystems and makes policy recommendations on green economy pathways AfDB + WWF Report This report presents examples of solutions that promote the creation of wealth and alleviation of poverty through more sustainable management of the natural capital of the continent. These strategies focus on: reducing the negative effect of human consumption on natural capital; maintaining natural capital with additional and targeted investment; and highlighting the socio-economic benefits from investing in natural capital and natural resources management. At Stake Ecosystem services underpin all aspects of our lives and economies yet are often taken for granted. At the same time the Millennium Ecosystem Assessment found that over the past 50 years, humans have changed ecosystems more rapidly and extensively than in any comparable period of time in human history, largely to meet rapidly growing demands for food, fresh water, timber, fiber, and fuel. The loss of services derived from ecosystems has been identified as a significant barrier to the achievement of the Millennium Development Goals to reduce poverty, hunger, and disease. Core Messages : 1 The world today lives in a resourceconstrained world and many countries are living beyond their means. 2 Africa, as a whole, is not yet in biocapacity deficit where its ecological footprint exceeds available biocapacity but continuing with business as usual would lead it into deficit within a generation. 3 Ecosystem services on which we depend are being degraded as a result of human pressures on the environment linked to our demand for natural resources. Consequently, we are losing these services, increasing our vulnerability to economic and environmental shocks and stifling development. 4 Africa has choices in terms of its development pathways. Pursuing a more sustainable approach to development than those taken in some other parts of the world can generate benefits in terms of environmental security, human well-being and increased competitiveness. 5 The Rio+20 Connection The 2012 Ecological Footprint report will be launched on the continent at the Bank s Annual Meeting in Arusha, Tanzania and globally at Rio +20, in Rio de Janeiro, Brazil June. As we all know, the Rio+20 conference will mark the 40th anniversary of the Stockholm United Nations Conference on the Human Environment (Stockholm Convention); 25th anniversary of the Brundtland report; 20th anniversary of the Class United Nations aptent Conference taciti on sociosqu Environment ad and per inceptos Development, the outcome of which was Agenda 21; and the 10th anniversary of the World Summit on Sustainable Development, referred to as the Johannesburg Summit. The principal objectives of the Conference are to secure renewed political commitment to sustainable development, assess the progress and implementation gaps in meeting already agreed upon commitments, and address new and emerging challenges. 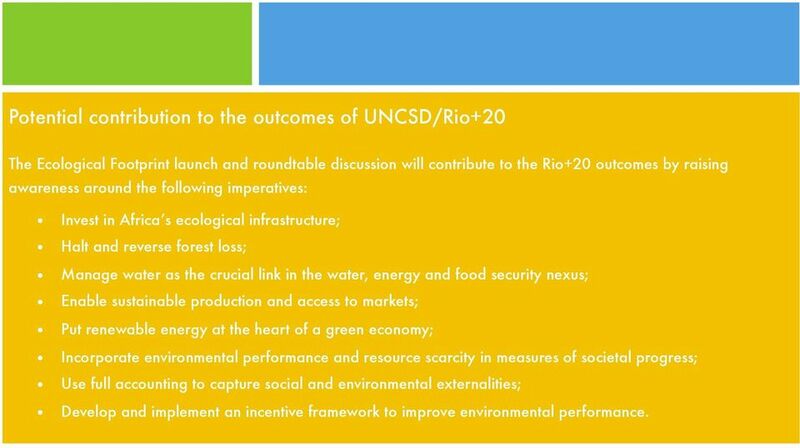 The Rio+20 Conference is consequently seen as a much needed platform to address, in a coherent and coordinated manner, the emerging challenges across world regions associated with the implementation of sustainable development. The AfDB and WWF launch of the report and the video that illustrates the report aims at demonstrating that a green development path is possible for Africa if we can chart development paths that invest in green infrastructure for sustainable development in Africa and in other countries that derive resources from Africa. To what gain? To raise awareness on the concept of ecological infrastructure and to demonstrate that new green investment in the protection, maintenance and enhancement of ecological infrastructure is essential for sustainable growth; To demonstrate that the ecological footprint of Africa coupled with a deficient level of investment in ecological infrastructure does or could contribute to the potential breach of planetary boundaries; To show the implications of breaching planetary boundaries, as well as the opportunities for mitigation and increasing ecosystem resilience through investment in environmental infrastructure; To provide policy- and decision-makers with compelling and logical cases for further investment in protecting, maintaining and enhancing environmental infrastructure such as sustainable fisheries, well-managed forests, protected areas, biodiversity protection, sustainable agriculture and sustainable use of freshwater resources; and To raise awareness for ecosystem-based approaches to development as an imperative to crafting a sustainable future for African nations and further contribute to the Bank s current refining of its strategic approach towards green and inclusive growth and natural resource management policies. 6 Potential contribution to the outcomes of UNCSD/Rio+20 The Ecological Footprint launch and roundtable discussion will contribute to the Rio+20 outcomes by raising awareness around the following imperatives: Invest in Africa s ecological infrastructure; Halt and reverse forest loss; Manage water as the crucial link in the water, energy and food security nexus; Enable sustainable production and access to markets; Put renewable energy at the heart of a green economy; Incorporate environmental performance and resource scarcity in measures of societal progress; Use full accounting to capture social and environmental externalities; Develop and implement an incentive framework to improve environmental performance. Why are resource limits now undermining economic performance? Defining Ecosystem Services Beto Borges Director, Community and Markets Program Forest Trends 6 April 2011 Defining Ecosystem Services What are ecosystems? Ecosystems in Uganda What are ecosystem services? Conclusions Towards a green economy Conclusions Moving towards a green economy has the potential to achieve sustainable development and eradicate poverty on an unprecedented scale, with speed and effectiveness. Will there be enough water? What the Comprehensive Assessment of Water Management in Agriculture says. Deborah Bossio, David Molden International Water Management Institute Will there be enough water? Ecosystem Services and Convention on Biological Diversity How ecosystem services are reflected in the CBD COP Decisions in Nagoya? Natural Capital at Risk KPMG, an Australian partnership and a member firm of the KPMG network of independent member firms affiliated with KPMG International Cooperative (KPMG International), a Swiss entity. How do Earth s surface processes and human activities affect each other? IS Desertification A Reality or Myth? What is desertification? UNITED NATIONS INDUSTRIAL DEVELOPMENT ORGANIZATION. Green Industry: Resource and energy productivity for low carbon industry development. ordinated way, while remaining focused on the long-term needs for a continent which aspires to earn its livelihood through trade and investment. Facts on biodiversity What is biodiversity? Biological diversity (biodiversity) comprises diversity of species and habitats as well as the genetic diversity within the individual species of fauna and flora. For a Green Economy Tomorrow, Private Sector Development Today will Tip the Scales! What challenges does Agriculture, Extension and Advisory Services face today? A transition to a Green Economy - A change in paradigm or greener shade of brown?